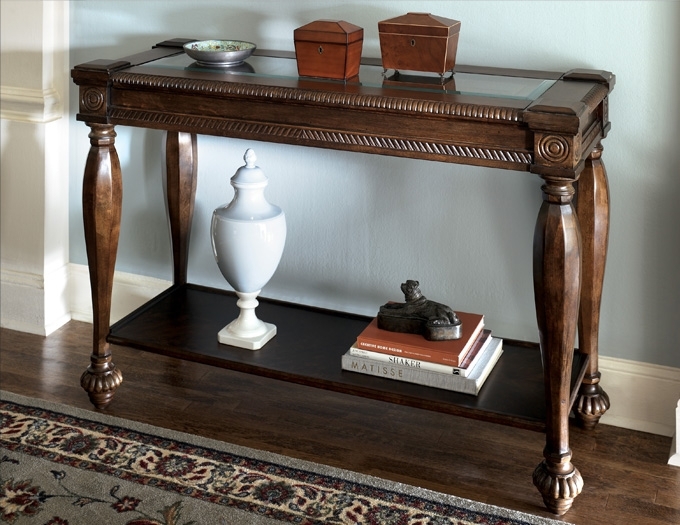 The Old World design accented beautifully with traditional European influences brings the rich style of the “Mantera” accent table collection to life. The rich brown finish beautifully bathes the turned chamfered posts with deep reeded details and the framed and overlaid ornamentation with a deep warm elegance. The table tops feature framed and raised panels beneath a clear glass insert with beveled and polished edges to add its own unique design to this sophisticated furniture. Enhance the beauty of your home with the Old World craftsmanship of the “Mantera” accent table collection. Rich brown finish. Constructed with select veneers and hardwoods. Shapely turned and chamfered posts with deep reeded details. Framed and overlaid ornamentation. Framed, raised panels shown through clear glass top insert w/ beveled & polished edges. RTA construction.